In a week Arizona’s Senate Bill 1070 will go into effect. That’s the bill that’s come to national attention, requiring police officers to ask people they’ve stopped for some other offense to show proof of US citizenship, given, of course, that said officers have sufficient justification for suspecting they might not be citizens. Another Arizona law forbids officers from ever using profiling, so that’s really not the issue here, even though SB 1070 also guards against profiling being used. But back to AZ SP 1070, and the ridiculous circus that has erupted around it. Do we need it? I think we do. Everyone I talk to here thinks we do. I have friends who work in the hospitals who can testify to the resources diverted to people who are not here legally (and hence pay no taxes, but do get free services). Emergency rooms are overwhelmed with people who cannot pay for their treatment but must, by law be treated anyway. Physicians, if they wish to use the hospital to treat their paying patients, must donate a particular amount of their time to working basically for free in order to service people who have entered the state illegally. Many of them leave the state, altogether. One group banded together to build a new, private hospital to avoid the forced free service the other hospitals demand. One trauma unit closed because it could not afford to keep operating, drained by the influx of non-paying, illegal alien patients. My husband has encountered illegals hiding out in the bushes on his hunting trips. He has friends who tell alarming stories of their own encounters in the wilds. One was in his a tree stand, bow hunting in one of Stu’s favorite areas south of Tucson, when a group of drug runners came by, armed with AK-47s. They walked right under his tree, while he held dead still, All too aware that with only his compound bow to protect him against AK-47’s he had the very short end of the stick. Thankfully the drug runners appeared to ignore him until the guy who followed up the rear stopped right under his tree to look up at him, deliberately making eye contact. He held gaze with the hunter for a bit, then moved on. As soon as they were completely gone, my husband’s friend lit out as fast as he could back to his vehicle. He won’t hunt down there any more. Neither will my husband. We have friends who have illegals walking through their property on a regular basis. Recently a rancher was killed by illegals down in Douglas. Across the street in our middle class neighborhood, about ten years ago, the man of the house was murdered by Mexican hit men. He was subsequently found to be involved in the drug trade. Our crime rate is pretty high and much of it involves the same drug trade from south of the border. 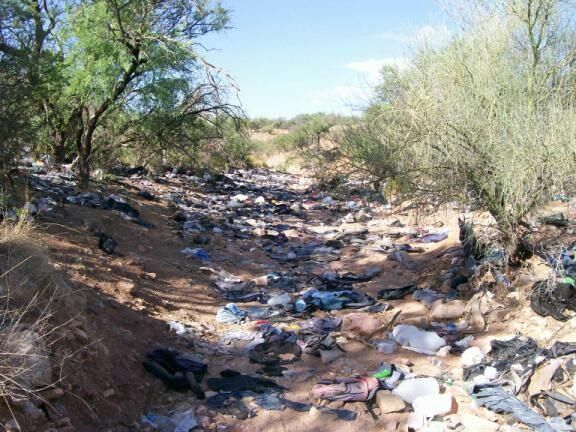 A couple of years ago, the local news ran a story about the way illegals were coming up through the San Pedro Riparian Conservation area east and south of Tucson, and trashing it up horribly — plastic milk bottles, soiled diapers, feces, etc. Recently an email went around about it, which I didn’t save, and then when I wanted to find it for this post, though I searched the web… I failed to locate it. I did find some photos from another site, not far south of Tucson. The caption accompanying the photo at left said it is estimated that over 5,000 discarded backpacks are in this wash, as well as countless water containers, food wrappers, clothing, feces, and “thousands” of soiled baby diapers. I understand the need these people feel to escape their own desperately dysfunctional country. But resorting to illegal entry just isn’t the answer. We don’t have the resources to provide for all of them (schools, buses, medical, welfare in some cases), they take jobs that US citizens would otherwise have, especially in the difficult economic times we are in, they take money but pay no taxes and send much of it back to Mexico, instead of contributing to our economy. Some would argue that others come up from Mexico to shop, but I’m not sure it evens out, and regardless, it’s still illegal. It’s also not fair to those who have entered this country legally — paid the fees, jumped through all the hoops, waited patiently, learned English, learned about the government… And many of them are no happier about our porous borders than the rest of us. Jesus said “The poor you will have with you always,” and though He performed miracles of healing, and fed thousands of people with free bread and fish… He didn’t do much of anything to alleviate poverty. And however many He healed, there were many more He didn’t heal. He didn’t come to perform physical healings, those where just a metaphor for what He did come to do: die for the sins of the world. The miracles also got people’s attention and testified that He really was from God. This entry was posted in Arizona, Illegal Immigrants, Photos, politics and tagged Arizona, AZ SP 1070, Illegal Immigrants, politics on July 21, 2010 by Karen Hancock. I’m from Arizona too, and your post is right on. We have a serious border crisis, and it’s frustrating that some politicians have made it out to be an issue of racism. Many of the people who have publically made negative statements about SB have also been found to not have read the bill or have displayed an obvious lack of understanding regarding the crisis we have here. Equally frustrating are the statistics I hear, that not only a majority of Arizonans, but a majority of the USA see’s SB 1070 as a positive bill. My husband and I were recently on a trip to San Diego and were shopping in a local store when the owner came up to us and started making conversation. After finding out that we were from Arizona he was eager to tell us that his state’s politicians, with their threat to boycott Arizona, were not representing the people of California, who also experience their own problems with border security. He even told us he wrote a letter to their city counsel and had his sons do so as well. My heart goes out to the people of Mexico and their struggles, but entering our country illegally is not the answer. Karen, Cash too, had an encounter with a group of illegals on his hunting lease west of Del Rio. I was stunned when he told me he was not armed at the time. He was out scouting around the couple section ranch for new deer stand locations during the off season. Of course they were armed! Cash took off in the other direction. It is getting worse here month by month. Several Texas state senators are making noise and plan to write a bill very much like the one y’all have. Needless to say, they have my support! I do not know about sanctuary cities in Arizona, but we here in Texas know that Houston and Austin certainly are classed as such. The man running against Gov. Rick Perry, is Bill White, the former mayor of Houston who embarrasses the illegal population and would love to make this whole state into one giant sanctuary. Good Grief! It is going to be an interesting few months until the November elections.